Escape is a short film documenting the rescue and rehabilitation of Maasai girls who have undergone female genital mutilation (FGM) and early marriage, two practices that go hand-in-hand in Kenya. 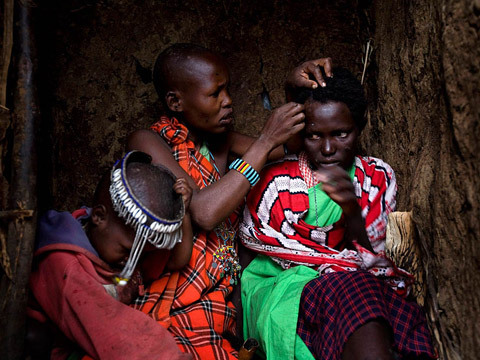 Female circumcision and child marriage continue to take root in poverty-stricken communities that consider women as lucrative property to be “sold” to the highest bidder. The film depicts the lives of several young women and the various paths that some are forced to make. Naanyu Sekut, approximately thirteen years old, marries a man more than twenty years her senior. Her cousin, Seleyian Sekut, ten, is rescued from her husband. Others like Carolyn, Jennifer, Mary, Salula and Teresia were rescued by the Tasaru Safehouse for Girls, where they are provided shelter, security and free primary and secondary education. We are introduced to their stories not only about physical pain from undergoing “the cut,” but also the emotional turmoil following their union with older men and their subsequent rescue from a lifetime of subservience. The movie explores the tenacity of some village elders bent on continuing a deeply rooted practice and the struggle by a growing segment of the community to redefine “tradition” despite the consequences. Marvi Lacar is a native of the Philippines and moved to the US at the age of fifteen. She started her career as a photojournalist in 2004 where she covered domestic and international assignments for clients such as The New York Times, Time, Newsweek, Stern, Reader’s Digest, Marie Claire, Glamour and Discovery Inc. Lacar has been recognized by Communication Arts, American Photography and Photo District News, among other awards, for her photography. Lacar’s work on female genital mutilation and early marriage in Kenya was her inspiration to transition from photography to film hoping for a medium that would allow the subjects to express their stories in their own voice. Escape is her short film documenting stories of Maasai girls who were rescued or ran away from FGM and child marriage, and incorporates her still photographs.